Russian President Dmitry Medvedev has called into question the further use of Tu-154 planes, after an engine exploded on one of the aircrafts on January 1, leaving three dead and 40 injured. ­"If it is found that this is a common defect, then we need to think about further exploitation of this type of aircraft, or make necessary capital reconstruction of electricity supply systems," Medvedev said. The Tupolev-154 was being used on Kolavia Airlines flight 348, heading to Moscow from Surgut in western Siberia. The airliner was taxiing prior to takeoff when a fire started on board. More than 100 people were inside. According to passengers, black smoke first filled the cabin and sparks flew in the air while people were literally climbing over the heads of one another in order to get out. Medvedev ordered the Transport Ministry to conduct a proper investigation. The Tupolev-154 is considered to be the most successful plane in Russian manufacturing history, with around 1,000 of them produced since 1968. 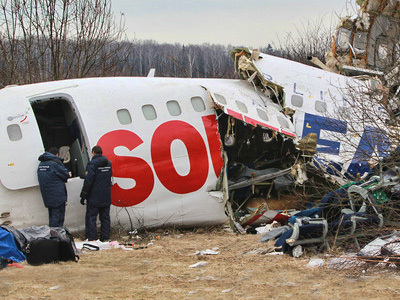 The passenger plane is still one of the main workhorses of Russia's domestic aviation. It reaches speeds of over 900 kilometers per hour and is among the fastest in its class. Despite being criticized for its safety record, aviation experts say all fatal incidents are usually not due to faults with the aircraft's design. 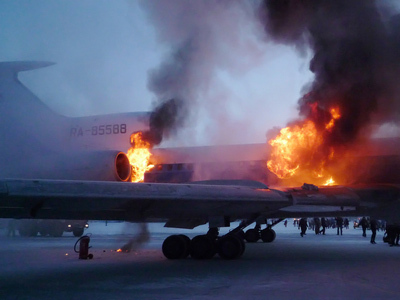 This is the second crash of a Tu-154 in less than a month. The previous incident happened in December at Moscow’s Domodedovo Airport, when a Dagestan Airlines plane suffered engine failure en route to the southern Russian republic. Two died and more than 80 were hurt when the plane skidded off the runway and broke up. Pilot error is being investigated as a possible cause.